Welcome to the website of Crisis Research Center. We provide training to obtain practical skills in the field of emergency medicine. Crisis Research Center offers the most popular courses that are recognized around the world. Our students gain knowledge and skills, required in the field of emergency medicine and adapt them effectively in their daily work. You will learn only what you need. You work in the field of emergency medicine, and our courses cover those situations that you face most often in your daily practice. Save your time. You can study theory at home, as you receive course material in advance, and learn more practical skills during training courses. 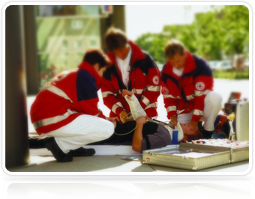 You will receive standard and internationally recognized training, such as BLS, ACLS, ALS, PHTLS, PALS, ATLS, ALSO, MIMMS. Crises Research Center is a partner and a direct representative of many renowned organizations, so the courses are conducted exactly in the same way as in all other parts of the world. We are authorized to issue internationally recognized certificates. Learning is fun. The courses are conducted by certified instructors, professionals in their field, who have their clinical practice and can understand your needs even better. Skills and certificate will be appreciated appropriately. Heads of most medical institutions admit that courses organized by Crises Research Center assure ideal continuing training and adequate competence. It is very convenient. You can attend the course on your own, join your colleagues from other institutions or we can come to you. Crisis Research Center is a vibrant and energetic organization with bold and initiative professionals who fulfill their dreams of sharing their knowledge and experience. Crisis Research Center offers world wide acknowledged courses and provides solutions in emergency medicine to save human life and health. Crises Research Center has been organizing and conducting training in the field of emergency medicine for many years now. The exceptional feature of all our courses is a particular focus on the development of practical skills. We believe that well-developed skills, precise actions and manipulations lead to success in a daily struggle for patient‘s life in the setting of emergency medical care. You may choose from a range of worldwide known courses, which are already accepted as standards of emergency care, and serve as valuable tools of continuous medical education, certification and licensing of the medical professionals. After completing the course, participants receive certificates endorsing a high-level of theoretical knowledge and practical skills. Crisis Research Center encourages each person to discover their creativity, wisdom and power to change the surrounding enviroment to make it safe, friendly, and ensuring effective care in emergency situations. Our VISION is a vibrant and energetic organization with bold and initiative professionals who fulfill their dreams of sharing their knowledge and experience, and providing high-quality training. Our MISSION is united strength to fight for life and health in emergency situations. Freedom and Responsibility are two sides of the coin. You can feel free to make your decisions, fulfill your dreams, and change the environment. But freedom and responsibility for your actions remain closely linked. Human health is a core value for us, and we strive for it. Lifelong learning in a changing medical environement is an integral part of professional excellence, which we strive for. Value „Z“- come to us and we will talk about it. © 2019 Crisis Research Center. All rights reserved.